This is a great sandal that can be found at most New Balance stores. The thick rigid sole offers maximal protection to the foot and I love the soft footbed, which offers decent arch support. The forefoot, midfoot and rearfoot control offers biomechanical control, which helps decrease pain, chance of injury and mechanical strain. Gotta’ love the Naots! A bit more of a casual look but the rigid sole combined with the soft footbed and solid forefoot, midfoot and rearfoot strapping is great for biomechanically controlling for the foot, which dramatically improves comfort to not just the foot – but also the knees, hips & lower back. The Wolky line of shoes offers high quality shoes with excellent biomechanical control for the foot and ankle. 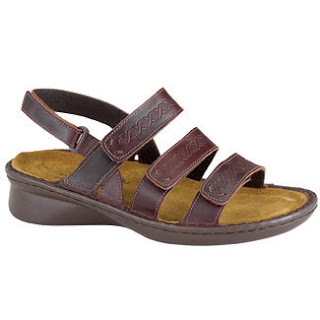 One of my favorite aspects of this sandal is the thick rigid sole that is protective of the joints. The footbed is soft and has fabulous arch support. It’s an expensive sandal but consider it a solid investment in your foot health! I’m a big fan of all of the Alegria shoes that have rearfoot strapping! Don’t be fooled and get the shoes or sandals that don’t have rearfoot strapping or control – you will be cheating yourself of comfort. 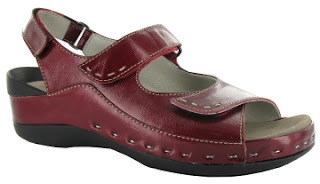 This sandal has an awesome thick and rigid sole with a soft footbed with good arch support. 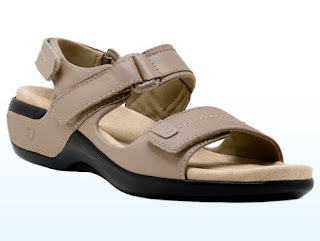 As long as you also have rearfoot control, this sandal will increase comfort, decrease chance of injury and cause less “wear and tear” on the foot and ankle joints.